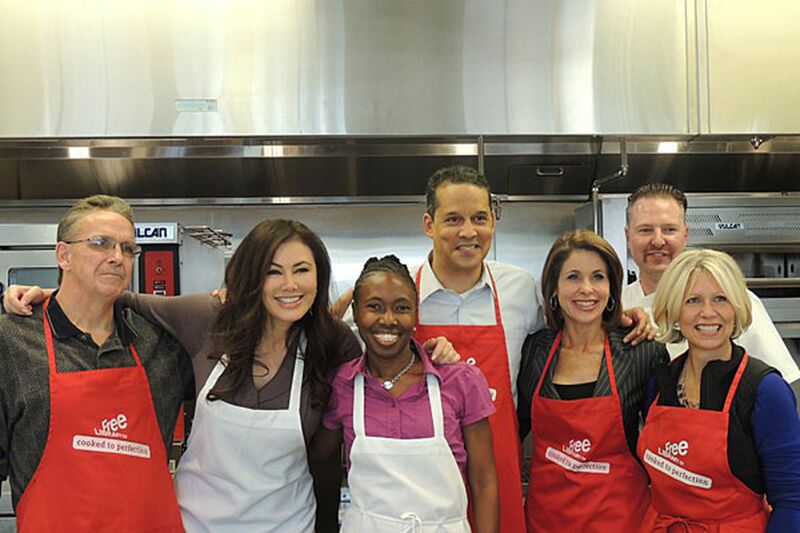 Three local TV personalities cooked for a cancer benefit with three cancer survivors. Here: Andrew Slachta, Fox 29's Lucy Noland, Rhonda Ulmuer, Fox 29 Iain Page, CBS3's Kathy Orr, Chef Steve Irlenborn and Laing Meyer. The trio (along with local cancer survivors Andrew Slachta, Rhonda Ulmer and Laing Meyer) whipped up meals that could be served with any good turkey dinner, including stuffing with Italian sausage, vegetarian collard greens and sweet potato casserole. Page was not shy about his novice cooking skills. He said that when he was first dating his wife long distance - he was in New York, she was in D.C. - she asked him why he always ate out. He said he couldn't cook. So she offered to make him a home-cooked meal. When he came home to find nothing simmering on the stove he asked what happened. "Well," she said, "you don't have any pots, pans or plates." "Oh," he replied. "Do you need those?" Sixteen years and triplets later, he's still new to the kitchen. Judges Marilyn Russell, of BEN-FM, chef Ben Thomas, of Bryn Mawr's Restaurant Cerise, and restaurateur James Reardon chose the Noland-assisted collards as the winner of the event. Noland received $1,000 to donate to the Bridesburg Community Food Pantry. Vincent "Don Vito" Margera, the Delco-born former star of nephew Bam Margera's reality show "Viva La Bam," is ailing, according to an Instagram post from Bam's brother Jess. "Everyone send positive vibes Don Vito's way today," Jess Margera wrote. "He's in the hospital right now and he's having a pretty tough time." Don Vito was found guilty of two counts of sexual assault on a child in 2007 stemming from an incident at an autograph signing in Colorado. Benj Pasek, the Friends Central grad who was nominated for a Tony for writing the score of a musical adaptation of "A Christmas Story," along with partner Justin Paul, has a high-profile gig in the works. Pasek and Paul are set to work with Hugh Jackman on his new musical, "The Greatest Showman on Earth," about the life of circus magnate P.T. Barnum. They'll contribute songs to the film directed by Bill Condon, who is used to the musical game - he helmed the Beyonce-starrer "Dreamgirls." If you want a taste of Paul and Pasek's earlier work, the 11th Hour Theatre Company will mount the duo's first off-Broadway production, "Dogfight," based on River Phoenix's last film, this weekend as part of the company's concert series. For more info, go to 11thhourtheatrecompany.org. La Salle grad Joe Romano has a song on tonight's "Nashville." Viewers can hear his tune, "Wake Up and Smell the Country," on the ABC sudser. WMGK's John DeBella helped a whopping 9,000 families to Thanksgiving goodness last year with his annual Turkey Drop, but it looks as if this year might see more turkeys flying the coop. Turkey Drop partner City Team Philadelphia has seen a record number of sign-ups for holiday meal assistance this year, including many seeking help for the first time. DeBella's Turkey Drop takes place on Nov. 25, at LOVE Park, where the morning man will broadcast from 6 to 9 a.m. while doling out birds. During that time, other WMGK personalities will take donations at Giant supermarkets in Pennsylvania and at Cherry Hill Classic Jaguar. They'll also take donations at wmgk.com. * Songwriter Paul Anka, Sidney Kimmel and Jerry Blavat were seen dining at Butcher & Singer (1500 Walnut St.) after Anka surprised Kimmel at a dinner thrown by Jefferson University and Hospitals to present Kimmel the Award of Merit. Anka hopped onstage to perform one of his more famous ditties, "My Way," with lyrics to honor Kimmel, including "You donated millions of dollars / and you did it your way."